A couple of years ago, I bought a beautiful whole octopus from Sun Fat in San Francisco’s Mission District. Inspired by a travel documentary on Greece, I had visions of making a gorgeous stewed octopus topped with olives and lemon. It was the first time I’d ever broken down an octopus – quite challenging when you don’t know your way around one. A few hours later, I pulled my stew off the stove and sliced one of the legs. To my chagrin, it was tough. Jules tried to be diplomatic about it, but it was a terrible failure. It mostly went in the trash. It took a lot of time before I even wanted to attempt octopus again. I’d heard so many different methods for tenderizing the octopus: beating it against a rock, boiling water baths, cooking it with a cork, salting it…I honestly didn’t have the patience to try any of them, until my friend Lisa over at Nomiku decided to make octopus for our mutual friend’s birthday. I did it myself this weekend, and let me tell you – I’m fairly certain I will never cook octopus another way! For this recipe, you will need a sous vide circulator. Obviously, I’m using one of Lisa’s Nomiku circulators – it’s compact and super easy to use, and they are not paying me to tell you this! Put all the ingredients in a bag, massage gently, and then put into the 84°C water bath for 4 hours. Save the juice for use in anything else – it’s basically stock. I used mine to make a pretty fantastic paella the next day. To serve, lightly char the outside of the octopus on a grill or using a kitchen blowtorch. Slice, arrange onto a platter, and top with sauce. Add all ingredients except oil to a food processor or blender and process, adding the oil in a steady stream with the motor running. Transfer to an airtight container and refrigerate for a few hours to let the flavors blend together. Add freshly ground black pepper to taste. Recipe based on Nomiku’s version here! jenny gaither: meant to move you. I’ve always been terrified of cooking octopus too. 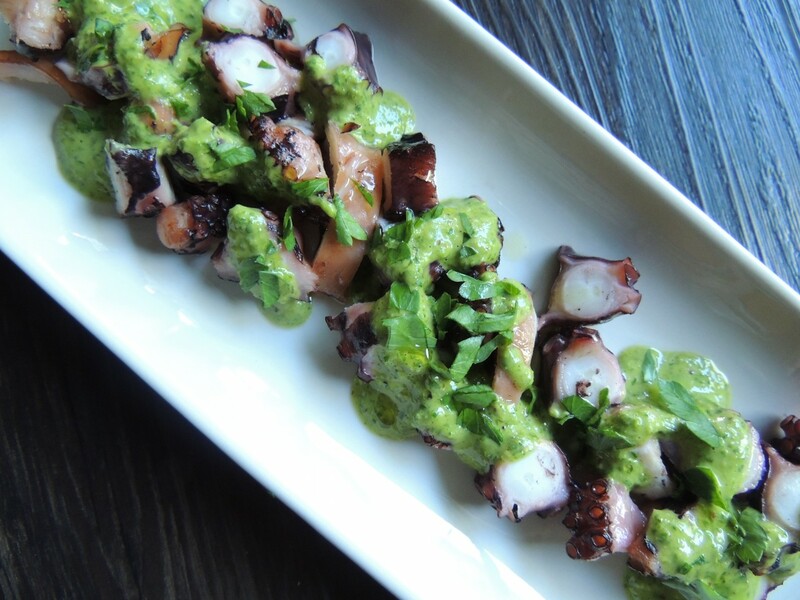 Have you ever attempted an octopus carpaccio? Do you think sous-viding would work for that? I have not attempted a carpaccio but I think it would work! The sous vide technique practically guarantees that the octopus comes out tender when cooked. I’m not 100% sure of the level of firmness required (as I understand, you would just slice it very, very thinly). Are you going to do it? If so, let me know how it goes, because now I want some! I think I’ll try it out soon and when I do I’ll let you know how it goes…. This recipe looks great. Thanks so much. Octopus is one of those foods for which sous-vide seems to have been invented. Just the other day I served octopus sous-vide to some Italian friends, and they were amazed how tender and flavorful the octopus was. The temperature or time can be a bit shorter that what you did. I haven’t done side-by-side experiments with different times and temperatures for octopus sous-vide yet, but it always comes out great. That is so true! I had the hardest time with octopus before discovering sous vide. How else do you prepare octopus? Any suggestions for a different sauce? I like to prepare it the Italian way, as a “salad” (insalata di polpo). After cooking the octopus sous-vide (without smoked salt or smoked paprika), allow to cool and slice. The marinate with good extra virgin olive oil, freshly squeezed lemon juice, minced fresh flat leaf parsley, salt, and freshly ground black pepper in the refrigerator. Serve slightly chilled (i.e. colder than room temperature and warmer than refrigerator temperature). This is a simple recipe that really allows the delicate flavor of the octopus to shine, like so many Italian recipes.